Nose: Notes of grapes on the nose, more the darker ones. This is complemented by sweet sherry and vanilla, with grain and cereal flavours in the back. Slightly spiced oak with a mix of fruity, herbal, and earthy notes. Reminds me of a strong beer with a fruity and malty character. Palate: Surprisingly sweet on the palate with a delicate fruitiness of dark grapes, vanilla, and honey. This is accompanied by a warming spiciness of oak, pepper, and subtle nutmeg. Becomes drier towards the finish. Finish: The finish is medium long, sweet and creamy with a slightly warming but sweet oaky spiciness, nutty flavours and a very dry end. With water: Water tames a bit of the fruity sweetness bringing more herbal flavours and bitter notes of grapeseed to the fore. Stays sweet on the palate but less warming with a tamed spiciness. Slightly fruity notes of grapes in the back. The finish is a bit shorter with prickling oak and an extremely dry end. 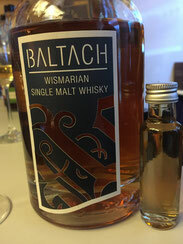 Comments: This is a fruity, sweet and mild single malt from the German Hanseatic city Wismar on the Baltic Sea coast. Although only three years old this dram already shows great promise. Surprisingly mature with a nice balance of sweet, fruity and lovely spicy flavours. The nose reminds me of a strong beer whisky and indeed, the distillery has a long history in beer brewing at the “Brauhaus am Lohberg zu Wismar”. Quite tasty and quaffable. Well done folks!